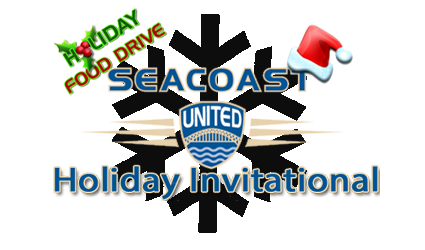 Seacoast United is excited to announce on December 15th & 16th, 2018 we will host the fourth year of our annual Holiday Invitational Tournament and food drive held at the Topsham Indoor Arena! Last year we had a great turn out with over 60 teams competing and nearly a 1000 lbs. of food donated during the holiday break. The tournament is made up of brackets from U8 to Adult Open and not only provides an opportunity for almost anyone, but also an opportunity to give back to the community*! *As part of the holiday spirit teams that donate canned food items to our donation bin will be entered into a raffle. For every canned item donated, you will receive a raffle ticket. The winner of the raffle will get their tournament fee waived! This event is for teams ages U8-Adult! Entry fee is $275 per team and each team is guaranteed 3 games. Click here to view photos of our past tournament champions!